In the morning of August 6, 2008, all Tskhinvali offices and shops were closed. The urgent evacuation of innocent civilians to Russia was in progress, while from there by-turn, Russian mercenaries and journalist were arriving. Izvestia (daily newspaper in Russia) was proudly informing, that the volunteers from Moscow are arriving to South Ossetia, Ossetian radio broadcasted the news that the war began. South Ossetian forces opened mortar fire on Eredvi, Prisi, Avnevi and Nuli villages. The crossfire resulted in several injured people from both sides. At night from August 6 to 7, 2008, the field headquarters of North-Caucasian military district was allocated in Java, and the Leningrad military district field headquarters – in lower area of Kodori Valley. A reporter from the Political News Agency (АПН) was informing from Vladikavkaz: “The whole republic <…> everyone saw (starting form yesterday the sixth) the movement of the huge number of troops towards Roki tunnel”. Journalist of Nezavisimaya Gazeta (Independent Newspaper), who was moving from Vladikavkaz to Tskhinvali in order to be on time for the beginning of unfolding war, wrote what she saw August 6: “Russia is drawing up serious military forces to the border of Georgia. Military columns and separate cars with crews and armored machinery are moving from Alagir to Zaramag by Transkam. Military men state, that training is still in progress, but there is no doubt, that in this manner Russia is demonstrating its determination to defend its citizens in South Ossetia, and even to conduct an operation of compulsion to peace”. Three weeks later she emphasized: “I saw our army in full operational readiness”. August 2 – “The training “Caucasus-2008” is over, everything is worked out, now we will evacuate innocent civilians, conduct mobilization, and afterwards someone will regret”. August 5 – “Russian Federation will wait several days in order to let the whole world see who is an aggressor, we and “voluntaries” will hold out in the meantime, and later one aggressive force will have a hard time”; “Briefly, Georgia will be a firing ground for new model arms and ammunition and utilization of old ones, particularly there are lots of high-explosive bombs of different caliber with expiring date, so the Backfires will not economize on them”. 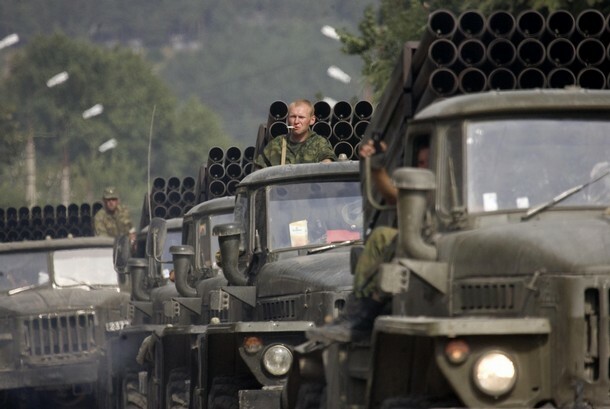 August 6 – “Today we will get even with aggressors, they will answer for everything”. At 22:58 of August 6, he confidently predicted: “I think, it will start in nearest hours, I have grounds for saying that’. In the evening of August 6, 2008, the President of Georgia – Saakashvili immediately tried to telephone the President of Russia Dmitry Medvedev in order to discuss the hazardous development of events in South Ossetia and in Russian-Georgian relationship. The response of the Russian ministry of internal affairs, which is organizing telephone conversations between Presidents, was cold: “Time for telephone conversations of the Presidents has not come yet”.